How to Pick the Perfect Diamond | Shane Co. Clarity refers to the purity of the diamond. Clarity is evaluated by viewing the number and size of a diamond's inclusions under 10X magnification, from I2/I3 (obvious inclusions) to IF/FL (internally flawless/no inclusions). Cut refers to a diamond's symmetry, proportions, and polish, which determine how much it sparkles. Why you get a prettier diamond for your money at Shane Co.
You can't judge the beauty of diamonds by their lab grade alone. You have to see the diamonds in person to know if they sparkle, because diamonds with the same grade can have very different amounts of sparkle, depending on where the inclusions are located inside the diamonds. Shane Co.'s diamond buyers go to the stone cutters around the world and examine groups of diamonds already sorted by grade. Then they handpick only the diamonds with the most sparkle from within each grade for our stores and our website. Whatever diamond grade you choose, you will clearly see the difference in the way Shane Co. diamonds sparkle. Diamonds are sold by the carat (ct), which is a unit of weight, not size. One carat weighs 200 milligrams, the world standard since 1914. A carat is divided into 100 points, with one point corresponding to .01 carat. Clarity refers to a gemstone’s purity. Virtually all diamonds contain tiny natural birthmarks that are present to varying degrees. These marks serve as the identifying fingerprint that makes every gemstone unique. Clarity is evaluated by viewing the gemstone under 10X magnification. Clarity grades range from FL (flawless) to I3 (contains obvious inclusions visible to the naked eye). Color refers to the color within the diamond, not the color of the reflected light. The absence of color makes one diamond more precious than another. The whiter or more colorless the gemstone, the more rare it is, and higher the price it will have. Color is graded with letters ranging from D, which is completely absent of color, to Z, which is light yellow. Cut has the greatest single influence on a diamond’s sparkle. Of the four qualities that define a diamond's value, the cut is the only one determined by a human being. A skilled diamond cutter realizes the rough diamond's potential. They cut and facet the crystal to reflect the maximum amount of light inside the gemstone and back through the top of the diamond. Diamonds can be cut too shallow or too deep, both of which cause light to leak out of the bottom and sides of the stone, diminishing its sparkle. Hear the word "diamond" and the first image that comes to mind is likely a classic round sparkly gem. No surprise, considering that 75% of all diamonds sold today, particularly engagement rings, are the round brilliant cut. Because a round diamond is symmetrical, it reflects nearly all light that enters it, making it the most brilliant of all diamond shapes. However, if your tastes lean to the less traditional, you can also choose from a wide selection of attractive diamond shapes on the market today. These are collectively known as fancy cuts. Fancy shapes are cut to different proportions, so they filter light differently. The full-cut round diamond represents the highest advances in diamond cutting, maximizing fire and brilliance. When in doubt, the round is always a smart choice. 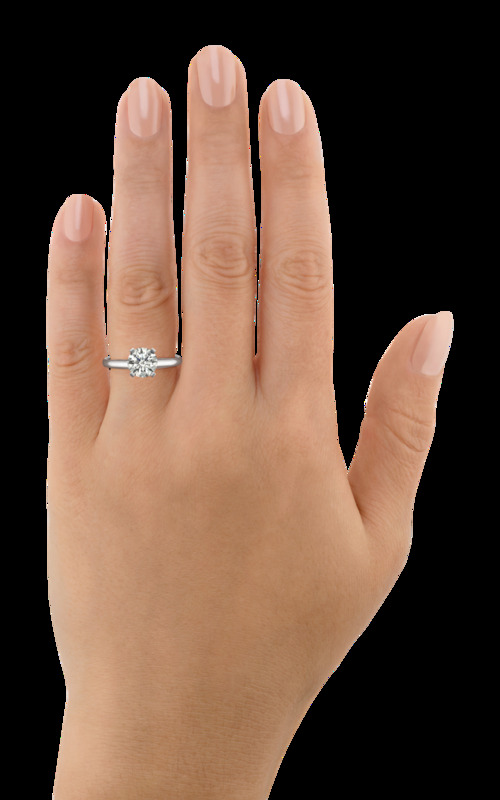 The oval is an elliptical shape that is based on the brilliant cut. Because it creates the illusion of length, it is a popular style for a woman with a small hand or short fingers. A variation on the brilliant cut, the marquise is an elongated shape with pointed ends. Its shape is flattering to the small hand, making it appear longer. The teardrop-shaped pear makes a beautiful ring. Its cut is a cross between a brilliant and marquise, and is also well-suited to the woman with a petite hand or short fingers. The heart-shaped diamond is the most romantic of diamond shapes. It is like a pear shape, but with a cleft at the top. The cutter's skill comes into play in creating a gemstone with an even shape and a well-defined outline. The emerald shape is a rectangle with corner facets and broad, flat planes. Good clarity and color are essential – in fact, you will rarely see one in lower grades because inclusions and body color are much more obvious in this shape. Square-shaped with many sparkling facets, the princess cut is one of the newest choices for the diamond engagement ring. It especially enhances the hand with long, elegant fingers. The radiant shape is similar to an emerald cut, but with a facet arrangement that gives it brilliance comparable to that of a round diamond. Radiant cuts have angled corners and can range from square to rectangle. A marriage between a Round and Princess cut, ranging from square to rectangular with rounded corners. Often referred to as the “square emerald cut”, it is a “stepped” square cut with cropped corners and is a wonderful choice for the fashion-forward woman desiring a dramatic engagement ring. These diamonds are available on special request at Shane Co. The Shane Classic Diamond is an ideal cut with exacting specifications proven by the laws of optics to reflect and refract the most light, providing fire and brilliance beyond your imagination. So rare is the quality of the Shane Classic that less than 1% of the world’s diamonds will meet the Shane Classic's standards of perfect proportion, symmetry and polish. In fact, few diamond cutters in the world possess the skill and experience to cut the Shane Classic Diamond to such perfection. The Shane Classic is a true classic. There are no extra facets, and we do not manipulate the light in our stores when showing you diamonds to make them appear prettier than they really are. Nor do we use any other gimmicks that would detract from the timeless beauty of a perfectly cut diamond.